MASHABANE ROSE’S EXHIBITION AT THE 2014 SOPHIA GRAY LECTURE. 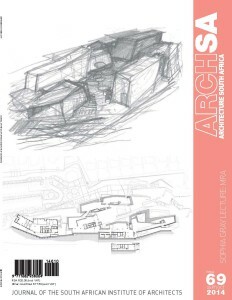 THIS YEAR’S PRESTIGIOUS SOPHIA GRAY MEMORIAL LECTURE, HOSTED EVERY YEAR BY THE DEPARTMENT OF ARCHITECTURE AT THE UNIVERSITY OF THE FREE STATE, WAS PRESENTED BY PHIL MASHABANE AND JEREMY ROSE OF MASHABANE ROSE ASSOCIATES. FORMED IN 1995, MASHABANE ROSE ASSOCIATES ARCHITECTS AND URBAN DESIGNERS HAS ALWAYS BEEN INVOLVED IN PROJECTS IN THE HERITAGE SECTOR. EARLY IN OUR PRACTICE, WE WERE COMMISSIONED TO DO HERITAGE REPORTS ON SITES IN AND AROUND SOWETO THAT ENCOMPASSED PERSONALITIES AND EVENTS THAT FORMED PART OF THE LIBERATION STRUGGLE. SOME OF THESE REPORTS FORMED THE BASIS FOR PROJECTS THAT WE HAD TO MOTIVATE FUNDS FOR TO BECOME REAL PROJECTS. EVENTUALLY THEY WENT AHEAD, BUT IT OFTEN TOOK A FEW YEARS AND SEVERAL PRESENTATIONS TO MOVE FORWARD. DRIVEN BY A BELIEF THAT THESE PROJECTS WOULD IMPACT POSITIVELY ON OUR DIVIDED SOCIETY AND ASSIST PEOPLE EXPOSED TO HUMAN RIGHTS VIOLATIONS, WE FELT IN SOME WAY WE WERE ENGAGING IN THE WIDER PROCESS OF HEALING AND RECONCILIATION. I REMEMBER WHEN WE COMPLETED AN EXHIBITION IN CATO MANOR, THE CLEANING STAFF HIRED TO TIDY UP AFTERWARDS STOPPED WORK AND WATCHED THE VIDEOS AND LATER WEPT WHEN THEY SAW THAT THE HISTORY BEING PRESENTED WAS THEIRS – SPECIFICALLY, THE RACE RIOTS AND BEER-HALL RIOTS THAT OCCURRED IN 1949 AND 1959 RESPECTIVELY. THIS SEEMED TO MAKE IT WORTHWHILE: WE WERE TELLING THEIR STORY AND PLACING THESE STORIES FIRMLY IN THE PUBLIC DOMAIN. WE HAD A SIMILAR REACTION WHEN A GROUP OF GRANDMOTHERS ARRIVED AT A HECTOR PIETERSON MUSEUM COMMUNITY MEETING WITH NEWSPAPER CLIPPINGS THEY HAD KEPT FOR ALMOST 25 YEARS – THEY ATTENDED THE MEETING TO MAKE SURE THE PROJECT WAS TELLING THE STORY OF THE SCHOOL CHILDREN AND UPRISING. AT THE TIME, THERE WAS A COMMERCIAL DEVELOPMENT PROPOSED BY SOWETO BUSINESS GROUPS COMPRISING A HOTEL AND SHOPS TRYING TO WIN SUPPORT FROM THE COMMUNITY. THESE COMMUNITY MEETINGS AND THE COMMITMENT OF THE PARTICIPANTS SHAPED THE OUTCOME OF THE HECTOR PIETERSON MUSEUM AND CONTINUE TO REMIND US OF THE VALUE OF THIS WORK. SUBSTANTIAL RESEARCH LIES BEHIND THESE PROJECTS. HISTORICAL, SOCIAL AND SPATIAL LANDSCAPES WERE UNPACKED TO BEGIN TO UNDERSTAND THE PARTICULAR MOMENT IN HISTORY BEING COMMEMORATED. MULTI-DISCIPLINARY TEAMS OF HISTORIANS, FILM-MAKERS, PICTURE RESEARCHERS, ARCHITECTS AND CURATORS WERE ASSEMBLED. IT WAS BETTER TO HAVE A DEEPER UNDERSTANDING OF THE EVENT – THIS UNDERSTANDING OFTEN GAVE THE PROJECT STRONGER MEANING IN ITS CONTEXT. AS ARCHITECTS, THE CONTEXT IN WHICH WE BUILD MATTERS MORE THAN JUST THE ARCHITECTURAL CONTEXT – THERE EXISTS A NARRATIVE TO REINFORCE IN THESE UNIQUE HISTORIC SETTINGS. THIS SPECIAL SIGNIFICANCE IS AT THE CENTRE OF OUR CONCERNS WHEN CONSIDERING HOW TO ACT AS ARCHITECTS ON THE DESIGN OF THE INTERIOR AND EXTERIOR, AND HOW WE ENGAGE WITH THE URBAN PRECINCT, WITH ALL ITS DYNAMICS. POWERFUL VISUAL FORMS OF HISTORY ARE REQUIRED WHERE THESE NARRATIVES HAVE BEEN PREVIOUSLY OVERLOOKED IN FAVOUR OF THE ENGLISH AND AFRIKAANS HISTORIES OF COLONIALISM AND INDUSTRIALISATION. PHIL MASHABANE HAS SERVED ON SEVERAL PUBLIC BODIES, INCLUDING THE NATIONAL MONUMENTS COUNCIL (NMC) AND THE SOUTH AFRICAN HERITAGE RESOURCE AGENCY (SAHRA). MORE RECENTLY, HE SERVED A TERM AS THE PRESIDENT OF SACAP. HIS WORK AND TIME SPENT IN THESE SECTORS HAS CONTRIBUTED TO OUR PRACTICE’S SUBSTANTIVE UNDERSTANDING OF THE VALUE OF HISTORY AND MEMORIALISATION. ANOTHER UNIQUE ASPECT OF OUR WORK OVER THE PAST 18 YEARS IS OUR PASSION FOR ENTERING COMPETITIONS. WE HAVE ENTERED ALL OF THE LARGE-SCALE COMPETITIONS IN SOUTH AFRICA AND MANY INTERNATIONAL COMPETITIONS. MUCH OF OUR BUILT WORK HAS COME OUT OF A SIGNIFICANT NUMBER OF THESE WINNING ENTRIES. NOT ALL OF THE PROJECTS WE WON, HOWEVER, PROGRESSED TO THE NEXT STAGE, BUT THIS DOES SEEM TO HAPPEN IN A POLITICALLY-CHARGED DECISION-MAKING ENVIRONMENT. SOME OF OUR MORE SCULPTURAL WORK HAS BEEN DEVELOPED IN COMPETITIONS AND HAS TAUGHT US A LOT ABOUT THE MAKING OF FORM AND THE GENERATION OF A CONCEPTUAL ARCHITECTURAL IDEA THAT IS NEW AND INTERESTING. THERE IS NO DOUBT THE COMPETITIONS IMPACTED ON OUR LATER BUILT WORK. WE SEE THIS IN PROJECTS LIKE THE CANADIAN MUSEUM FOR HUMAN RIGHTS FOR WHICH WE WERE SHORTLISTED AS ONE OF EIGHT, HAVING CONCEPTUAL SIMILARITIES WITH THE FREEDOM PARK MUSEUM PROJECT AND THE GOLDEN GATE PROJECT. WE ALWAYS HAVE VERY TALENTED YOUNG ARCHITECTS WORKING WITH US TO HELP MAKE SOME OF THESE WORKS – THEY ARE PASSIONATE AND IMMENSELY HARD-WORKING. DAYS AND NIGHTS ARE GIVEN UP FOR THE MAKING OF A SIGNIFICANT PIECE OF ARCHITECTURE WHICH MAY ONLY REMAIN IN DRAWINGS AND MODELS, BUT IT ALWAYS SEEMS WORTH IT AS WE ARE ORIGINATING SOMETHING NEW. FORTUNATELY, WE HAVE OFTEN BEEN SHORTLISTED FOR OUR ENTRIES AND HAVE BEEN ABLE TO RECOVER SOME OF THE ENORMOUS COSTS OF HANDMADE WOODEN MODELS AND BEAUTIFUL DRAWINGS. OUR APPROACH TO COMPETITIONS HAS BEEN TO WORK ON A NARRATIVE IDEA OR CONSTRUCT THAT IS SUGGESTED BY THE BRIEF AND TO FIND SPATIAL CONCEPTS THAT REINFORCE THIS. HAND SKETCHES ARE MADE TO CAPTURE THESE IDEAS AS THEY EVOLVE. WE HAVE ALSO MADE SOME VERY BEAUTIFUL PLANS AND SITE-PLAN DRAWINGS TO CAPTURE THE SPIRIT OF THE IDEA AS BEST WE COULD. WE MAKE USE OF HANDMADE MODELS TO EXPLORE SOME OF THE IDEAS AND FIND THIS MEDIUM POWERFUL EVEN IF THE IDEAS MORPH OR ARE ABANDONED – THEY ARE A NECESSARY PART OF THE PROCESS. A CONVERSATION IN THE OFFICE DEVELOPS AROUND THE SCHEME WHICH IS CONSTANTLY UPDATED AS WE THINK THROUGH THE IDEA – WE KEEP TALKING ABOUT IT AS IT HAS A WAY OF EVOLVING INTO A CLEARER NARRATIVE WITH A SINGLE EXPRESSED IDEA. WORD PICTURES ARE REMARKABLY POWERFUL FOR THE VISUALLY AND SPATIALLY LITERATE, ESPECIALLY AMONG A GROUP OF PASSIONATE AND DYNAMIC DESIGNERS. THE LECTURE IS TITLED ‘LANDSCAPE, HISTORY AND CONTEXT’ AS THESE WORDS ARE RECURRENT IN OUR WORK AT DIFFERENT INTENSITIES. IN SOME INSTANCES, LANDSCAPE MAY REFER TO THE SOCIAL, POLITICAL OR PHYSICAL LANDSCAPE. THE WORD IS USED MORE OPENLY AND METAPHORICALLY. HISTORY IS INTERTWINED WITH MEMORY AND CONTEXT REFERS TO THE IMPORTANCE OF THE CONTEXTUAL ARCHITECTURAL LANDSCAPE, WHICH IN OUR VIEW SHOULD ALWAYS BE CONSIDERED, REINFORCED AND IMPROVED. THIS REFERS TO THE GROUP OF PROJECTS THAT CONTRIBUTE TO TRANSITIONAL JUSTICE, NATIONAL HEALING AND RECONCILIATION, AND LEAD TO A DEEPER UNDERSTANDING OF OUR COMPLEX HISTORY. THE SITE FOR THIS PROJECT WAS AT A POINT OF CONVERGENCE OF A ROAD SYSTEM AND THE HISTORIC MARCHES THAT TOOK PLACE IN JUNE 1976 WHEN STUDENTS SET OUT FOR ORLANDO STADIUM. WITH THE CLOSURE OF ONE ROAD, WE WERE ABLE TO FORM A BUILDING FRONTED BY A PUBLIC OPEN SPACE IN THE CENTRE OF ORLANDO WEST THAT IS UNFENCED AND TODAY IS STILL UNDAMAGED BY VANDALISM. IT IS HEAVILY USED BY LOCALS CRISS-CROSSING IT ON THEIR WAY TO WORK AND TRANSPORT POINTS, AND VISITORS WANDERING AROUND THE COMMEMORATIVE SPACE. HAVING LEARNED FROM EXTENSIVE RESEARCH INTO THE EVENTS OF JUNE 16, THE MOVEMENT OF STUDENTS ALONG THE ROADS AND THE CLASH WITH POLICE THAT LEAD TO THE DEATH OF HECTOR PIETERSON, WE WERE ABLE TO DEVELOP THE BUILDING AS A DEVICE TO UNPACK THE EVENT ITSELF BY FRAMING PORTIONS OF IT WITH WINDOWS AND VIEWPORTS TO CLEARLY ARTICULATE SPATIALLY WHAT OCCURRED. THE BUILDING SLOWLY RAMPS UP OVER THREE METRES TO SECOND-FLOOR LEVEL: IT FRAMES VIEWS AND WRITES TEXT ON THE GLASS THAT REFERS TO THE SIGNIFICANT MOMENTS OF THAT FATEFUL DAY. THE EFFECT IS POPULAR WITH VISITORS WHO HAVE AN ELEVATED VIEW OF SOWETO. THE OLD ‘RED BRICK AND SHEETING’ HOUSES BUILT IN 1948 THAT SURROUND THE BUILDING ARE USED AS A FINISH ON THE INSIDE AND OUTSIDE OF THE BUILDING. THE SUBTITLES ON THE BLACK AND WHITE FILMS WERE ALSO DONE IN RED, AS WERE SEVERAL OTHER ARCHITECTURAL ELEMENTS. 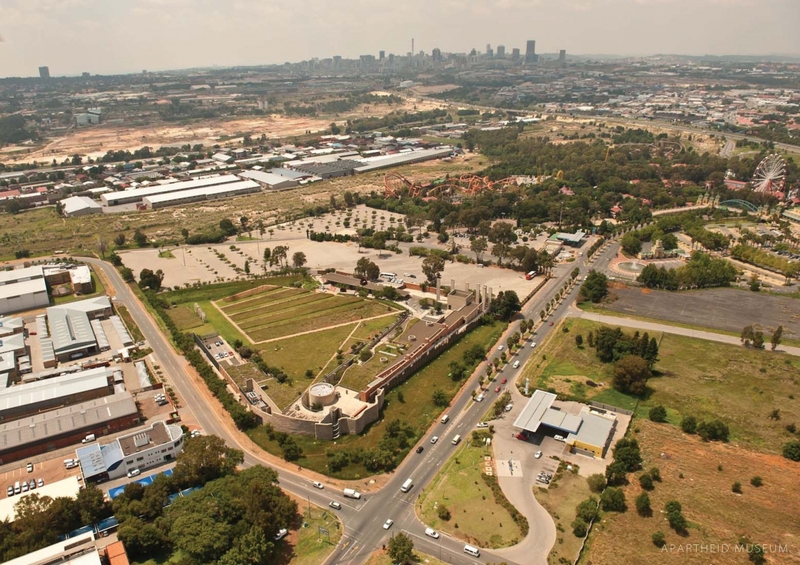 THE USE OF THE RED BRICK IS PARTICULARLY NOTEWORTHY WHEN SEEN IN THE AERIAL PHOTOGRAPH, WHERE THE SCHEME APPEARS TO FIT EASILY INTO THE TEXTURE OF ORLANDO WEST. INDEED, FROM MANY DISTANT VANTAGE POINTS, THE MEMORIAL SITS QUIETLY AND COMFORTABLY IN ITS SURROUNDINGS. THE BUILDING IS IMAGINED AS A LARGE BLOCK OF SCULPTED BRICK. THE PUBLIC SPACE IS EDGED WITH A LINE OF BLACK-SLATE WALLS TO SCREEN THE ROAD ACTIVITY AND CALM THE COMMEMORATIVE SPACE DOWN. A WATER FEATURE ENHANCES THE ORIGINAL MEMORIAL STONE, WHICH IS REPRESENTED, LIFTED AND HELD, MUCH LIKE THE LIFELESS BODY OF HECTOR IN THE WELL-KNOWN PHOTOGRAPH. ETCHED QUOTES IN GRANITE-TOPPED BENCHES COMPLETE THE NARRATIVE ELEMENTS OF THE PROJECT. THE CENTRAL VOID OR COURTYARD OF THE BUILDING IS FILLED WITH THE NAMES OF THE APPROXIMATELY 700 STUDENTS WHO DIED AS A CONSEQUENCE OF THE UPRISING, ETCHED ON BRICK-SIZE BLOCKS. SCHOOL GROUPS WANDER THROUGH THESE NAMES, LOOKING FOR THE ONES THEY REMEMBER AND LOCATING THE MORE FAMOUS NAMES. THE RED-BRICK INTERIOR ARCHITECTURAL DETAILS MAKE USE OF BENT STEEL-PLATE BALUSTRADE PANELS AND ANGLE-IRON FRAMES BOLTED TOGETHER, COBRA-WAXED TO A DULL FINISH AS A HARSH REMINDER OF THE WEAPONS USED TO CONFRONT THE SCHOOL CHILDREN. BLUE POLICE LIGHTS RECALL THE VEHICLES AND A BRIDGE IS BUILT TO TAKE THE VISITOR UP TO A WINDOW THAT FRAMES THE POLICE STATION ACROSS THE VALLEY, MARKING THE POINT FROM WHICH THE POLICE LAUNCHED THEIR OFFENSIVE. THE APARTHEID MUSEUM HAD ITS EARLY CONCEPTUAL DEVELOPMENT IN A SITE VISIT THAT TOOK PLACE WHERE A LARGE MOUND OF SOIL ALLOWED FOR AN ELEVATED VIEW OF THE JOHANNESBURG FROM THE SOUTH WEST, ACROSS A WASTELAND OF ABANDONED MINE DUMPS ON THE HORIZON. THE IMPORTANCE OF LAND AND LANDSCAPE TO A BUILDING THAT NEEDED TO RESPOND TO THE AFRICAN LANDSCAPE WAS DISCUSSED BY THE DESIGN TEAM, ALONG WITH THE MINING DETRITUS AND THE SPECIAL VANTAGE POINT THAT THE SITE OFFERED. EARLY ON, THE IDEA EMERGED OF A BUILDING PARTLY COVERED IN LANDSCAPING THAT ENGAGES WITH ITS SURROUNDINGS IN A NEW AND POWERFUL WAY. FROM THIS POINT, THE PROJECT BEGAN TO UNFOLD AS A BUILDING THAT WAS AN EXTENSION OF THE LANDSCAPE, PARTLY CONCEALED, PARTLY REVEALED. PATRICK WATSON, THE PROJECT’S LANDSCAPER, INTUITIVELY SAW THE OPPORTUNITY FOR SHAPING THE LARGE SOIL MOUNDS TO SCREEN THE UNSIGHTLY AND UNDERLINE THE MORE EXTRAORDINARY BY RAISING AND LOWERING THE LINE OF THE MOUNDS ON THE SITE. IN ADDITION, HE BROUGHT THE IDEA OF THE ‘SLIMES DAM’ WATER BODY TO MARK THE EDGE OF THE SITE. THE LONG, RAMPED ARRIVAL WALKWAY IS WALLED IN WITH A TALL GABION BASKET WALL AND RUSTY STEEL STRUCTURE TO REFER TO THE DISUSED MINES NEAR THE SITE AND TO SCREEN ROAD AND NEIGHBOURING BUILDINGS THAT UNDERMINE THE SPIRIT OF THE PLACE – A MUSEUM ON THE RISE AND FALL OF APARTHEID AS IT PLAYED OUT IN JOHANNESBURG FOLLOWING THE DISCOVERY OF GOLD. THE IDEA WAS TO CREATE A NARRATIVE JOURNEY THAT WOULD TAKE YOU FROM THE ENTRANCE UP TO THE VANTAGE POINT TO LOOK AT JOHANNESBURG BEFORE ENTERING THE ‘BELLY OF THE BEAST’, WHERE THE STORY OF APARTHEID UNFOLDS, IN ITS POWERFUL THEATRICAL MANNER. PART OF THE BUILDING IS PLANTED TO CAMOUFLAGE ITS BULK WITH INDIGENOUS PLANTING TYPICAL OF THE HIGHVELD. THE NEW BUILDING IS PLACED ALONG THE PERIMETER OF THE SITE TO ALLOW A MORE GENEROUS GARDEN AND FORM A HARD OUTER EDGE TO THE ROADSIDES. SINCE THE BUILDING WAS COMPLETED, IT HAS HAD SOME NEW ADDITIONS, INCLUDING THE RESTAURANT AND SHOP ON EITHER SIDE OF A COURTYARD, WHICH PROVIDES A WELCOME BREAK FOR A HARD-HITTING VISUAL STORY. AS WITH ALL MUSEUMS, THE WORK CONTINUES AS NEW DEVICES AND STORYLINES ARE INTRODUCED TO THE EXHIBITION. WE CONTINUE TO ENGAGE WITH THESE PROJECTS TO KEEP THE SPIRIT AND FEEL OF THE ARCHITECTURE INTACT. THE NEXT ADDITION IS A LARGE SPACE FOR TEMPORARY EXHIBITIONS AND EVENTS THAT MAKE BETTER USE OF THE GARDEN SPACE, WHICH IS BEGINNING TO HOST ARTWORKS – MOST RECENTLY, ONE BY WILLIAM KENTRIDGE. THE DETAILS OF THE BUILDING WERE DEVELOPED TO EXPRESS THE IDEA OF RACIAL SEPARATION. THE STEEL FRAME COVERED IN WIRE MESH SEPARATES PEOPLE AND CREATES SHOW CASES WITHOUT USING GLASS. THE STEEL ALSO FORMS AN ARMATURE TO SUSPEND AUDIO-VISUAL MONITORS AND OBJECTS. THESE FRAMES SEPARATE THE VISITORS FROM EACH OTHER AT THE ENTRANCE. THE FLOOR TOO STOPS SHORT OF THE WALL TO FORM A MOAT WITH CABLE-MANAGEMENT SYSTEMS CONCEALED IN THIS GAP. EXTERNALLY RUSTED STEEL ELEMENTS ARE USED TO FORM A FRAME WITH GALVANISED UNITS BOLTED ON TO EXPRESS A SIMILAR DUALITY. THE CONCRETE INTERIOR ELEMENTS WERE LEFT AS THEY WERE WHEN THE SHUTTERS WERE RELEASED, SHOWING THE ROUGH AND INCOMPLETE ALONGSIDE THE SMOOTH CONCRETE. THIS DECISION MADE ON SITE GIVES THE CONCRETE A MORE EMOTIVE SURFACE WHICH APPEARS BRUISED AND DAMAGED, WHICH HELPS RE-AWAKEN A SENSE OF SPACES ASSOCIATED WITH INCARCERATION AND DETENTION. THE DRAMA IS HEIGHTENED BY PLACING A LARGE CASSPIR POLICE VEHICLE USED IN THE 80S AND 90S AND RUNNING FILM TRACKS INSIDE THESE CROWD-CONTROL VEHICLES. THE LATEST SPACE TO BE DEVELOPED IS THE TRC SPACE, WHICH HAS A WHITE-COLOURED SCULPTURE OF THE TORTURE DESCRIBED IN THE HEARINGS. THE ROOM IS FINISHED IN BLACK-PUNCHED STEEL PLATE TO COMPLETE THE DRAMA OF THE SPACE. THIS SMALL CORNER-SITE HOUSE BUILT IN RED BRICK WAS THE FIRST HOUSE MANDELA BOUGHT TO LIVE IN, WHEN HE WAS MARRIED TO EVELYN. WINNIE MOVED IN LATER AND THE HOUSE WAS THE FOCUS OF SEVERAL POLITICAL ACTIVITIES OVER THE TIME MANDELA WAS INCARCERATED IN ROBBEN ISLAND. THE HOUSE NEEDED TO ACCOMMODATE VISITOR GROUPS FLOWING THROUGH AND PRESENT THE HISTORY OF THE HOUSE AND THE FAMILY WHO STAYED HERE. THE HOUSE ITSELF HAD BEEN MARKED BY FIRE BOMBING AND BULLET HOLES – THESE MARKS WERE KEPT AND ARE WOVEN INTO THE STORY OF THE HOUSE. PRESS-BUTTON AUDIO-VISUAL DEVICES ARE USED BOTH INSIDE AND OUTSIDE THE HOUSE. THE NEW BUILDING IS A FREE-STANDING OFF-SHUTTER CONCRETE STRUCTURE FORMED IN STACKED RED BRICK AND CONCRETE AND IS SYMPATHETIC TO THE NEIGHBOURHOOD’S RED-BRICK HOUSES IN TERMS OF SCALE AND COLOUR. THIS STRUCTURE PROVIDES BATHROOMS, A TICKET OFFICE, A SHOP AND A SMALL OFFICE TO MANAGE THE SITE. THE FENCE IS FORMED OUT OF SLENDER STEEL TUBES FILLED WITH SAND AND CAPPED OFF WITH CONCRETE. THE RED-PAINTED ROOF IS FORMED IN TWO SHEETS OF CORRUGATED IRON WITH INSULATION CONCEALED IN BETWEEN TO KEEP THE CORRUGATED IRON VISIBLE FROM THE INSIDE AND TO PROVIDE LESS HEAT IN THE TIN-ROOFED HOUSE. THE PAVEMENT AND WALKWAYS ARE FORMED IN STACK-BRICK BONDS. THE PROJECT IS HEAVILY VISITED ALL YEAR ROUND. THE POLICE AERIAL PHOTOS WERE USED BY THE NATIONAL MUSEUM ARCHAEOLOGISTS TO FIND THE ACTUAL REMAINS OF THE OLD FARM STRUCTURES. THIS WAS A LONG PROCESS OF CAREFUL DEMOLITION WORK TO UNCOVER THE ACTUAL WALLS AND FOOTINGS THAT HAD BEEN INCORPORATED INTO HOUSES AS THE FARM PORTION WAS BROKEN UP INTO SUBURBAN LOTS. IN ADDITION, THE ARCHAEOLOGISTS WERE LOOKING FOR THE GUN GIVEN TO MANDELA ON ONE OF HIS TRIPS IN AFRICA WHICH HE BURIED SOMEWHERE ON THE PLOT. AFTER A YEAR, WE MANAGED TO FIND THE SEVERAL EXISTING ELEMENTS OF THE HOUSE AND FARM OUTBUILDINGS AT THE TIME OF THE POLICE RAID. THESE STRUCTURES WERE THEN ADDED TO, USING CONCRETE WALLS TO REPLACE THE MISSING ELEMENTS TO FORM A SENSE OF THE VOLUME OF THESE STRUCTURES. THE MAIN HOUSE WAS USED BY THE WHITE FAMILY OF COMMUNIST PARTY MEMBER ARTHUR GOLDREICH, WHILE THE OUTBUILDING WAS WHERE THE ACTIVISTS LARGELY WORKED AND STAYED, WITH MANDELA POSING AS THE GARDENER DAVID MOTSOMAI. THE RAID WAS DEVASTATING FOR THE LEADERSHIP OF THE ANC AND SACP AT THE TIME, AS MOST OF THE LEADERS WERE ARRESTED (NELSON MANDELA WAS LATER APPREHENDED AT A ROADBLOCK NEAR HOWICK). THESE STORIES AND THE WORK THAT TOOK PLACE ON SITE IS DISCUSSED EXTENSIVELY IN THE EXHIBITION, AND IS CONTINUOUSLY RESEARCHED AND ADDED TO. TWO NEW BUILDINGS WERE PLACED ON THE PERIMETER OF THE SITE, A VISITOR CENTRE WITH AN AUDITORIUM SIZED FOR A BUS GROUP, AN EXHIBITION SPACE, A TEA GARDEN AND A SHOP, WHILE THE SECOND BUILDING COMPRISES OFFICES, A LIBRARY AND THE ARCHIVES FOR THE LILIESLEAF TRUST. THE CONCRETE ENTRANCE CANOPY IS FORMED AROUND EXISTING TALL TREES THAT SPLITS THE BUILDING INTO TWO ELEMENTS AND FORMS A COMFORTABLE UNDER-SHADE ARRIVAL. THE ROOFS ARE PLANTED SLABS USING INDIGENOUS GRASS TYPICAL OF THE FARM AT THE TIME. THE ROOFS ARE ACCESSIBLE WITH RAMPS AND STAIRS TO ALLOW VISITORS TO HAVE AN OVERVIEW OF THE EXISTING BUILDINGS WHERE THIS UNIQUE HISTORY PLAYED OUT. THE PLANTING OF THE ROOFS CAMOUFLAGES THE NEW BUILDINGS IN RELATION TO THE HISTORIC BUILDINGS, MAKING THE OLD DISTINCT FROM THE NEW. RED-BRICK STAIRS AND RAMPS ALLOW VISITORS TO COMFORTABLY NAVIGATE AROUND THE OLD STRUCTURES AND LARGE PANELS OF SHAPED LAWN CALM THE ENVIRONMENT DOWN VISUALLY, MAKING THE VISITOR MORE ACUTELY AWARE OF THE EXHIBITS IN EACH OF THE OUTBUILDINGS. THE OLD STEEL WINDOW OPENINGS ARE FILLED WITH BRICK TO SYMBOLICALLY SILENCE THESE OPENINGS AND MARK THEIR PREVIOUS PRESENCE. THE CELL PROJECT HAS ARISEN OUT OF SEVERAL PROJECTS THAT ENCOMPASS THE LIFE OF MANDELA IN THE FORM OF EXHIBITIONS. IN 2013, THE EXHIBITION OPENED AT THE HOTEL DE VILLE AND WAS CALLED ‘MANDELA – FROM PRISONER TO PRESIDENT’. A STEEL VERSION OF THE PRECISE DIMENSIONS OF MANDELA’S ROBBEN ISLAND PRISON CELL WAS PLACED OUTSIDE THE HOTEL DE VILLE TO GIVE VISITORS A CLEAR SENSE OF THE LEVEL OF CONFINEMENT. AT NIROX SCULPTURE PARK NEAR JOHANNESBURG, THE PROJECT WAS PRESENTED IN CONCRETE AND HAD A MORE SCULPTURED MASS AND WEIGHT. IT IS NOW BEING EXHIBITED IN SWEDEN AT A SCULPTURE PARK CALLED WANAS, ALONGSIDE ARTISTS SUCH AS MAYA LIN, YOKO ONO AND MARIA ABRAMOWICH. THE PROJECT HAS GONE FORWARD INTO NEW ENVIRONMENTS AS A SCULPTURE. IT IS THE MOST POWERFUL AND SMALLEST PROJECT WE HAVE BEEN INVOLVED IN. THE CELL IS FORMED IN CONCRETE AND THE WINDOWS ARE FILLED IN – THE ROOF IS REMOVED TO EXPRESS A CONNECTION WITH THE SKY AND A SENSE OF FREEDOM. THE CONCRETE SHUTTERS ON RELEASE ARE OFTEN NOT VIBRATED SMOOTH AND THE TEXTURE REFLECTS SURFACES THAT ARE DAMAGED, WHICH CONTRIBUTES TO THE EMOTIVE INTENT OF THE PROJECT. THE SCULPTURE OF MANDELA BY MARCO CIANFANELLI HAS BECOME AN ICONIC MARKER ON THE LANDSCAPE. WE PLACED IT IN THE LANDSCAPE BY CUTTING INTO THE SLOPE, CREATING A GENTLE RAMP TO THE POINT FROM WHICH THE BEST VANTAGE POINT IS FOUND. THE 50 PIECES OF STEEL THEN LINE UP TO FORM THE FAMOUS IMAGE. THE EFFECT IS QUITE SURPRISING AND THE INTERACTIVITY A WELCOME RELIEF FROM THE BRONZE STATUES THAT ARE STARTING TO BE PLACED AROUND THE COUNTRY. THE NEW SPACE WILL BE DEVELOPED AS A NARRATIVE HISTORY EXHIBITION FOCUSED ON MANDELA AND WILL BEGIN TO ENGAGE WITH THE HISTORY OF KWAZULU-NATAL TOO. THE EXHIBITION SPACE IS A WALK-THROUGH EXHIBIT THAT IS LINKED TO A LOOP ROUTE THAT TAKES YOU TO THE SCULPTURE AND BACK TO THE PARKING AND VISITOR FACILITIES. IT IS LIKELY THIS LOOP WILL LATER BE ANIMATED WITH TEXT PANELS AND SCULPTURAL INTERVENTIONS. THE BUILDING IS WRAPPED ENTIRELY IN RHEINZINK, ADDING A DARK CHARCOAL COLOUR TO THE WALLS AND ROOF, WHICH CONTRASTS WITH THE WHITE INTERIOR. THE POLISHED CONCRETE FLOOR AND WINDOWS FRAME SIGNIFICANT LANDSCAPE FEATURES AND THE ROUTE TO THE SCULPTURE. THE FINISH OF VERTICAL LINES OF 300MM, 400MM AND 500MM SHEET WIDTHS RESPOND TO THE VERTICAL SCULPTURE FROM THE SIDE AND THE TALL TREES OF THE FORESTS BEYOND. CURRENTLY UNDER CONSTRUCTION, THE BUILDING IS SCHEDULED FOR COMPLETION AT THE END OF 2014. IT WILL BE LEFT IN A LANDSCAPE OF GRASS TO FRAME IT AS A MINIMAL SCULPTURAL PIECE. TAUNG IS A DRY AND HARSH ENVIRONMENT: LIMESTONE QUARRIES, LARGE ROCK PILES AND THE REMAINS OF MINING STRUCTURES, INCLUDING HOUSING WITH CONCRETE BUNKS FOR WORKERS, STONE BUILDINGS AND CONCRETE-FILLED, STEEL-FRAMED STRUCTURES ARE FOUND ON THE SITE, GIVING IT ITS PHYSICAL CHARACTER. THE EXISTING STRUCTURES, PARTICULARLY THE WORKERS’ HOUSING, WILL BE ADAPTED INTO HOSTELS FOR STUDENT GROUPS AND INTO BOUTIQUE HOTEL-TYPE ACCOMMODATION. NOT ALL THE STRUCTURES ARE SUITABLE FOR ADAPTIVE RE-USE INTO ACCOMMODATION AND THESE ARE APPROACHED MORE POETICALLY. THE NEW INTERVENTION COMPRISES SEVERAL ELEMENTS TO BUILD UP MULTIPLE, LINKED VISITOR EXPERIENCES ACROSS THE EXTENSIVE SITE AT EACH SIGNIFICANT FEATURE. ARCHITECTURALLY, THE PROJECT ENGAGES WITH THE EXISTING RUINS IN A SCARPA MANNER AND LEAVES THEM AS THEY ARE FOUND, ADDING NEW ARCHITECTURE THAT IS DISTINCT FROM THE OLD. THE SUN IS HARSH AND DEEP SHADE IS FORMED TO MAKE PLACES THAT ARE COMFORTABLE IN THIS ENVIRONMENT. THE SUN LIGHTS THE EXTERIOR ARCHITECTURE AND THE SHADE FORMS THE INTERIOR ARCHITECTURE. STAND-ALONE NEW STRUCTURES, INCLUDING A WATER TOWER, WASHROOMS, SECURITY FACILITIES AND INTERPRETATION PAVILIONS AT THE CAVES ARE BUILT ENTIRELY OF CONCRETE, WITH STONE FROM SITE PACKED ON THE CONCRETE ROOFS. THE CONCRETE IS TEXTURED USING HORIZONTAL TIMBER PLANKS FIXED TO STEEL-SHUTTER PLATES, SIMILAR TO THE EXISTING STRUCTURES. ALL FINISHES ARE SELECTED FOR THEIR HIGHLY DURABLE QUALITY TO AVOID VANDALISM AND THEFT IN THIS REMOTE SETTING. SUNLIGHT IS IN PLACES ALLOWED THOUGH AS A SINGLE BEAM TO TRACK THOUGH SOME OF THESE SPACES TO INTRODUCE A SENSE OF TIME TO THIS ANCIENT SITE. THE SITE OF THIS PROJECT IN A PARK WHERE TWO RIVERS MEET WAS USED FOR ONE HUNDRED YEARS AS A MEETING PLACE TO RESOLVE ISSUES BETWEEN DIFFERENT TRIBES OF THE FIRST NATIONS PEOPLE. THIS SPECIAL SIGNIFICANCE OF THE LAND ITSELF GAVE RISE TO THE CONCEPT FOR THE MUSEUM. IT IS DESIGNED AS A SERIES OF CONVERGING VOLUMES THAT SLOWLY EMERGE FROM THE PARK AND CONVERGE TOWARD THE CITY. THE IDEA WAS TO GIVE EXPRESSION TO THIS UNIQUE POWER OF SITE NEXT TO A CITY THAT DEVELOPED LONG AFTERWARDS. A PEDESTRIAN ROUTE IS THEN FORMED THAT MEANDERS THROUGH THESE FORMS TO CONNECT THE CITY WITH THE PARK. THE BUILDING APPEARS LIKE LANDSCAPED SLOPES FROM THE PARK SIDE AND VERTICAL BUILDING FORMS FROM THE CITY SIDE. THE PROJECT HAS BEEN DEVELOPED AS A SURFACE RELIEF ON THE LANDSCAPE TO GIVE EXPRESSION TO ITS CULTURAL SIGNIFICANCE. THE JAGGED MOUNTAINS OF STELLENBOSCH FORM THE BACKDROP TO THIS PROJECT. THE DESIGN DEVELOPED FROM A DESIRE TO MIMIC THE MOUNTAIN OUTLINE AND TO MERGE THE SITE WITH THE HILLSCAPE. THE BUILDING WAS EXCAVATED INTO THE HILL TO CREATE ARRIVAL COURTYARDS LIKE DEEP CREVICES. WE ELECTED TO BUNDLE ALL OF THE PROGRAMME TOGETHER INTO ONE BUILDING TO CREATE A DYNAMIC AND ACTIVE ART SPACE IN ONE PROJECT. THIS WAS PARTLY DUE TO THE FACT THAT THE RIGHTS TO DEVELOP HOUSING (REQUIRED BY THE BRIEF) WOULD NOT BE GRANTED AS THE CITY WAS AIMING TO PRESERVE THE WINELANDS FROM HOUSING DEVELOPMENTS. THE SCHEME IS A CONCRETE SHELL WITH A SLEEVE OF VINEYARD CABLES WRAPPING IT TO ENCOURAGE VINE GROWTH TO SLOWLY MERGE THE BUILDING INTO THE WINELANDS LANDSCAPE.THE PROJECT WAS DESIGNED WITH A RAMPED WALKWAY TO CONNECT THE SPIER SIDE TO THE MOUNTAINSIDE TO ALLOW WALKS BEYOND THE BUILDING AND TO CONNECT THE PROJECT WITH LATER PHASES. THE ROBBEN ISLAND SCHEME CONCEPTUALLY APPEARED LIKE A WEDGE OF LIGHT FORMED FROM THE LIGHTHOUSE BEAM POINTED AT CAPE TOWN. THE SCHEME WAS DESIGNED BELOW THE BASE OF THE LIGHTHOUSE AND USING THE GENTLE SLOPE OF THE GROUND, SPACES WERE DEVELOPED THAT SLOWLY STEP DOWN TOWARD THE OCEAN AND GIVE EXPRESSION TO ‘RELEASE’. THE BUILDING WAS DESIGNED AS BEING CLAD ENTIRELY IN ROBBEN ISLAND SLATE, WITH A PLANTED ROOF TO HAVE VERY LITTLE IMPACT ON THE ISLAND’S SURROUNDINGS. THE PRIMARY NARRATIVE AND AUDITORIUM SPACES ARE DESIGNED INTO THE WEDGE FORM, WHILE THE COFFEE SHOP AND OTHER VISITOR FACILITIES ARE DISCREETLY CONCEALED UNDER A STEPPED AMPHITHEATRE ALONGSIDE THE PRIMARY FORM. THE CONFERENCE ROOMS ARE PLACED ADJACENT TO THE COFFEE SHOP FOR EASE OF FUNCTION. AT NIGHT, THE END GLASS WALL WILL BECOME VISIBLE BELOW THE LIGHTHOUSE BEAM FROM A LARGELY DARK ISLAND. THE CONCEPT COMPRISED LINKING FIVE EXISTING BUILDINGS IN THE MAIN STREET PRECINCT BELOW GROUND TO MAKE ONE SHARED ARRIVAL CONCOURSE WITH SUNKEN GARDENS AND LIGHT WELLS. THIS WAS DONE TO RESOLVE THE PROBLEMS OF LEGIBILITY FOR VISITORS AND SECURITY ISSUES FOR THE CLIENT WHEN STAFF MOVE FROM ONE BUILDING TO THE NEXT IN THE PRECINCT. EQUALLY IMPORTANT WAS TO AVOID IMPACTING NEGATIVELY ON THE HISTORIC 44 AND 45 MAIN STREET BUILDINGS THAT WERE THE SIGNATURE BUILDINGS OF ANGLO AMERICAN. THE BELOW-GRADE CONCOURSE ASSURED US OF THIS LIMITED IMPACT. THE ADDITIONAL SPACE REQUIREMENTS HAD TO BE ADDED IN A SENSITIVE MANNER. THE NEW ADDITIONS TO THE SANDSTONE-BLOCK BUILDINGS WERE DESIGNED AS GLASS BUILDINGS THAT CAREFULLY MAINTAINED THE LINE OF THE EXISTING BUILDINGS AND FITTED A GLASS-BLOCK STRUCTURE INTO THE SANDSTONE STRUCTURE LIKE A PUZZLE PIECE. THIS IDEA IS BASED ON THE HERITAGE CONCEPT THAT IF YOU ADD A NEW STRUCTURE, YOU SHOULD BE ABLE TO REMOVE IT LATER AND STILL FIND THE HISTORIC STRUCTURE INTACT. THE OTHER DESIGN DRIVER WAS TO BRING THE MINING IMAGERY OF STEEL HEADGEAR INTO THE DESIGN. THIS IDEA WAS APPLIED AT THE LINE LIFTS FORMED IN PLATE-JOINED I BEAMS WHICH WAS THE STRUCTURAL MINING SYSTEM OF THE TIME. A VIEWING BOX FORMED IN GLASS WITH A STEEL INNER FRAME WAS ADDED TO THE SOUTH TO OVERLOOK THE SUNKEN GARDENS AND THE HISTORIC 44 MAIN STREET ELEVATION. THE SCHEME IS UNDERSTATED AND HISTORICALLY SENSITIVE, GIVEN THE NATURE OF THIS IMPORTANT ARCHITECTURAL PRECINCT.